Domestic violence is always an issue that falls off the radar of public awareness, even when forced to confront it. So color me surprised when Law & Order: SVU star Mariska Hargitay recruited some celebs for her PSA about preventing sexual assault and domestic violence. 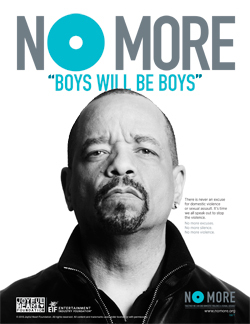 Rapper turned “106 and Park” host Bow Wow (now going by his gov name: Shad Moss), MTV’s Sway Calloway, Blair Underwood, and of course Mariska’s L&O co-star Ice-T lent their voices to say No More to domestic violence. The PSA campaign–airing on all Viacom networks: VH1, BET, MTV, Comedy Central, TV Land and Spike this summer–is a smorgasbord of celebs saying they won’t stand for violent relationships going unchecked. Can I get an amen on that? The videos are a product of a collaboration between Mariska’s Joyful Heart Foundation, an org dedicated to empowering survivors of sexual assault and domestic violence, and Viacom Velocity Creative (they brought the talent). “For the first time in history, the domestic violence and sexual assault movements are coming together under one symbol and one unifying message: “NO MORE. Together we can end domestic violence and sexual assault.” You can’t overstate the significance of sexual assault,” says Mariska in a press release.